Today when I rode in on MetroRail, the train was crowded and I had to stand up the entire way, about 15 minutes. I always have a book in my briefcase to read, and the one I am reading now is Longman and Dillard, An Introduction to the Old Testament (2d Ed. 2006). 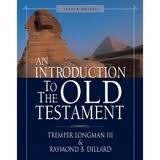 The book is used as a seminary textbook and is fascinating. It is a large hardback with a colorful cover and the title writ large. I had my nose in the book for the entire ride. Unwittingly I was an encouragement. It made my day. Maybe it made her day too.